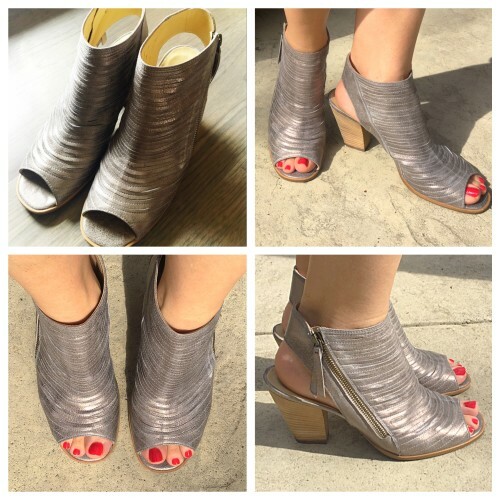 It’s no secret I adore shoes – particularly in spring when fresh styles emerge. My last visit to Nordstrom, I felt like a kid in a candy store. 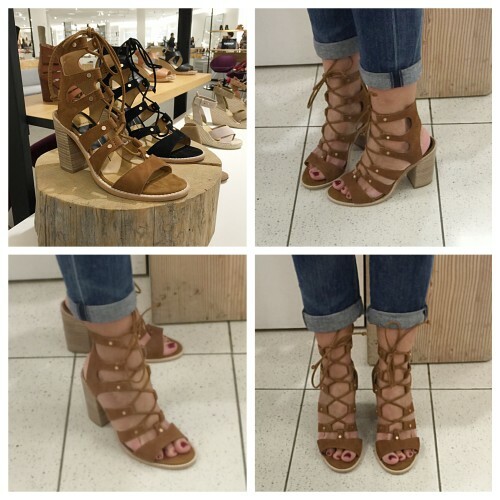 As I was picking up my Vince Camuto ‘Evel” sandals, I glanced around the vast shoe department and my heart started to race. It’s only March, there’s so much awesomeness yet to come. During my brief visit, I snapped off a few pics, let’s get shopping! 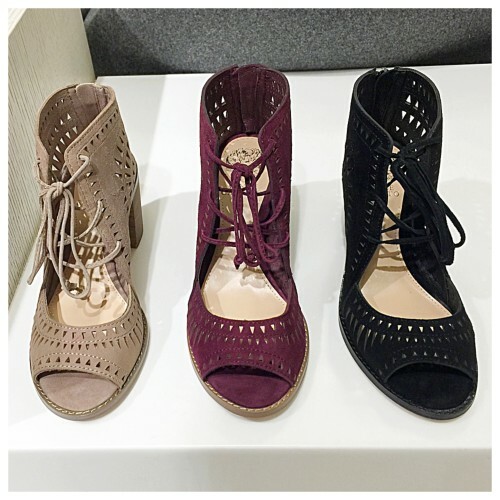 Lace-up anything: ballet flats, sandals, wedges, block heels and pumps. 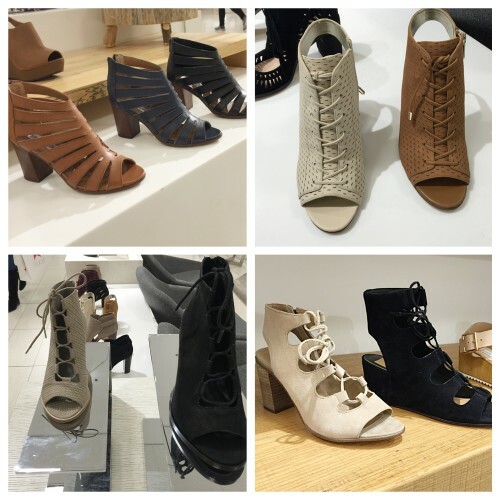 There’s truly something for every gal, wanting to try out a lace-up! 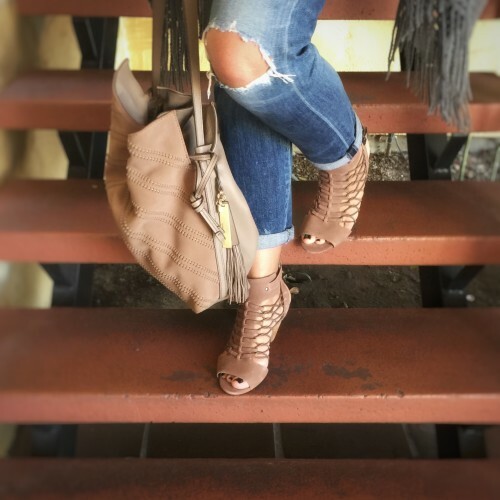 The Spring Bootie: from cutouts to fringe – I just love a peep toe bootie. Block Heels: oh so walkable. Wood Platforms: a must, for us boho gals! 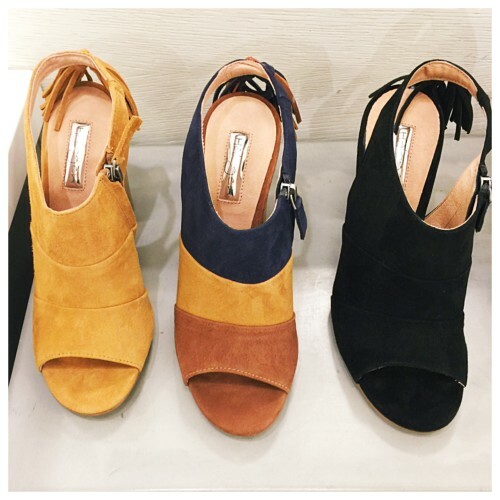 Wedges: this summer staple, is still going strong. With lace-ups now going mainstream, there are oodles of options to choose from. I am so in love with this shoe. Sadly, the 4″ heel is about 1/2″ too high for me – a deal killer. Of all the shoes I tried on, this was my favorite. If I thought I could last more than an hour in it, it would be in my collection. For you gals who love a heel – this is a great shoe. It is a bit of a hassle to lace up (no zipper), but boy does it look great on the foot. Also available in black. 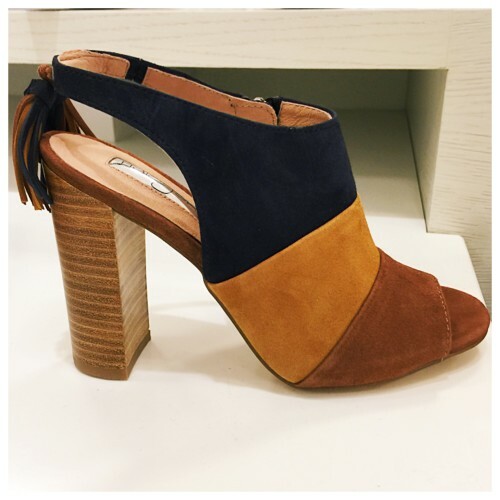 With a walkable 3″ heel, Nordstrom went big on this one, making it available in 6 colors! The ‘Tarita’ combines the block heel, lace-up, suede trend – all wrapped into one fabulous specimen. In 4 colors, this shoe is pretty fabulous! Super comfortable (for me it ran a bit long, I would most likely size down. Wearing my regular size 8.5, you can see there is a bit too much toe room). An everyday shoe – with just the right amount of heel. I think this shoe would go with just about anything! Are flats more your thing? Last spring, I picked up this lace-up flat, over at Boden. I like this shoe as an update to the ballet flat, with crop denim, skirts and dresses. Most of these styles are available in black, I just happen to love the neutral colors for SS16 – bonus; they make the legs look miles long! 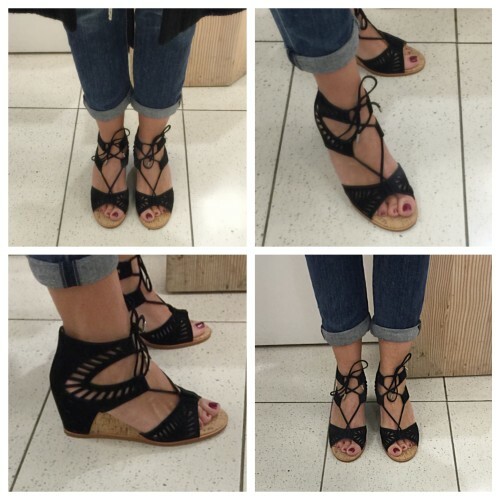 By now, you’ve probably seen me wearing my Vince Camuto ‘Evel’ Sandal. We were having lots of fun together – till the rain kicked in. We badly need the rain, so all is forgiven. This shoe is still on sale for $79.95, in 3 colors, the taupe being my favorite. 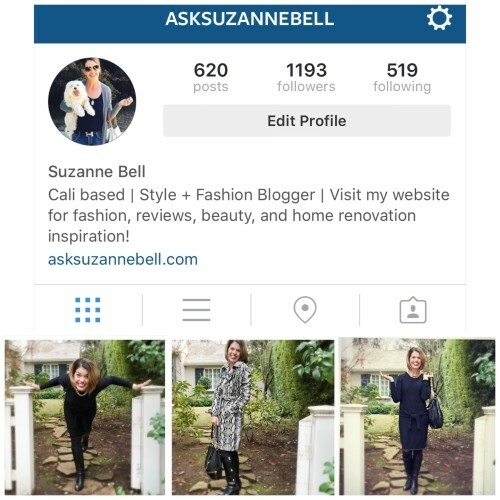 See these styled up HERE, with boyfriend jeans, on AskSuzanneBell. If the elastic side straps dig in and bother you, there are many other options available. Row 1: Paul Green ‘Cayenne’, 4 colors, Nordstrom, $349.00|Paul Green ‘Willow’, $349.00, Nordstrom | Paul Green ‘Prague’ Bootie, $280.00, Nordstrom. Row 2: Vince Camuto ‘Eliaz’. $119.00, Bloomingdales | Vince Camuto ‘Evina’, $119.00, Sole Society | Vince Camuto ‘Evel’, $79.95, Nordstrom. Row 3: Franco Sarto ‘Sierra’, $109.00, Nordstrom | Dolce Vita ‘ Amina’, $190.00, Nordstrom | Dolce Vita ‘Lyndon’, $150.00, Nordstrom. My girlfriend recently picked up the Paul Green ‘Cayenne’. She said it’s so comfortable, with no digging on the sides. 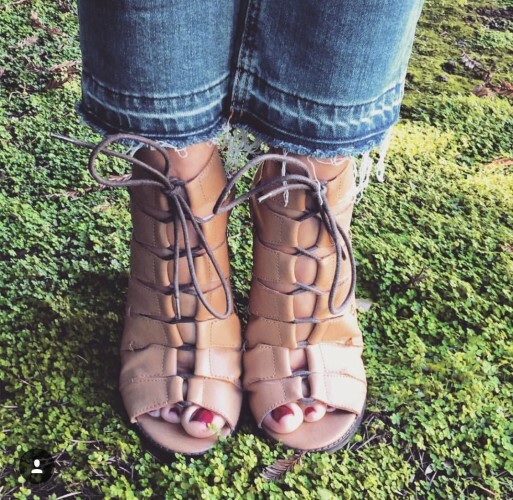 How fun is this spring bootie? I find block heels very sturdy and comfortable. I’m loving them right now on a mule, for a fresh new look. On my last visit, there weren’t a ton in stock yet, but this pair did catch my eye. No surprise, I’m drawn to the 70’s vibe of this shoe. 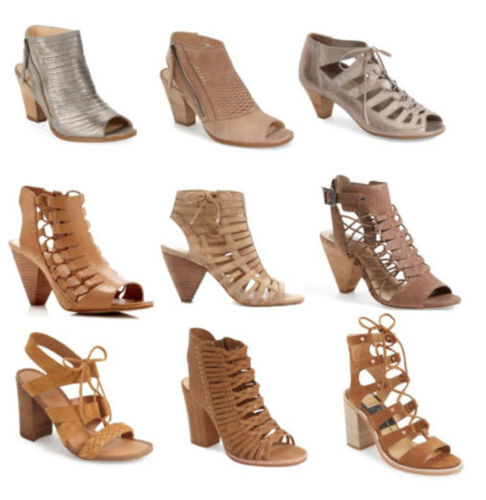 For those of you who like Banana Republic shoes, there are some great block heels and lace up styles on the BR website at the moment. What shoe are you most excited to try out? Do any of these styles speak to you? Have you tried any of these fun trends yet? Will you be trying a lace-up? Anyone else have a thing for shoes? 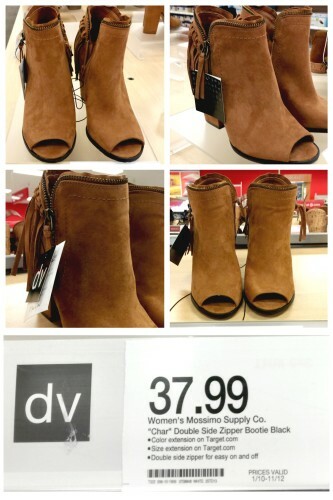 Being wedges are in an entire category of their own, we will be visiting them on Saturday, along with some fun finds from my last visit to Target, so be sure to pop on back this weekend! Hey fellow shoe fiend 🙂 whilst my choice of footwear borders on the edge of fantasy and rock n roll, we clearly share a common love for single-handedly supporting the shoe industry GRIN I’m not quite a fan of the stacked heel myself because I don’t believe anything lengthens the leg quite like a stiletto but I can certainly the aesthetics of the designs you’ve showcased. Arrrgghh. It’s all your fault, Suzanne, you make me want to go and buy a few new pairs now!!! I love how Sheela and you rationalize your obsessions! 🙂 I’m not as much into shoes as the two of you, but I have to say the shoes above are fabulous! And you do make me want to get some new shoes! 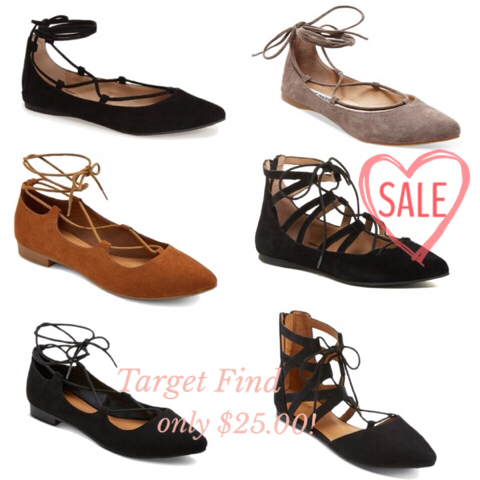 I’ve been looking for the “perfect” pair of lace-up flats and hope to get some soon!